Cycloid is a titan like beast with BIG head and one eye. He is incredibly strong, tough and eager for the fight. He has a single terrifying eye with a short deadly horn on his forehead and two vampire-like teeth. He finds humans both confusing and amusing. 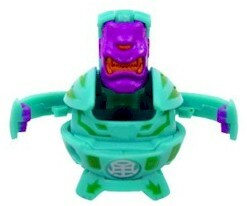 This bakugan is slightly clumsy, making it pretty useless against quick moving enemies and attacks. Purchase Cycloid from Amazon now!